For other uses, see Premchand (disambiguation). 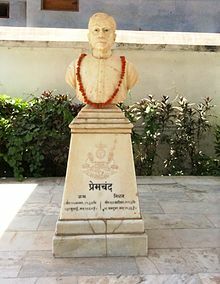 Godaan, Bazaar-e-Husn, Karmabhoomi, Shatranj ke khiladi, Gaban, "Mansarovar","Idgah"
Dhanpat Rai Shrivastava (31 July 1880 – 8 October 1936), better known by his pen name Munshi Premchand (pronounced [mʊnʃiː preːm t͡ʃənd̪] ( listen)), was an Indian writer famous for his modern Hindi-Urdu literature. He is one of the most celebrated writers of the Indian subcontinent, and is regarded as one of the foremost Hindi writers of the early twentieth century. He began writing under the pen name "Nawab Rai", but subsequently switched to "Premchand". Munshi being an honorary prefix. A novel writer, story writer and dramatist, he has been referred to as the "Upanyas Samrat" ("Emperor among Novelists") by writers. His works include more than a dozen novels, around 250 short stories, several essays and translations of a number of foreign literary works into Hindi. 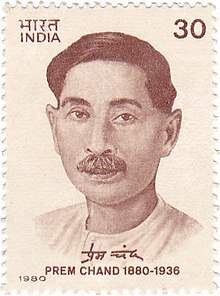 Munshi Premchand was born on 31 July 1880 in Lamhi, a village located near Varanasi (Benares) and was named Dhanpat Rai ("master of wealth"). His ancestors came from a large Kayastha family, which owned eight to nine bighas of land. His grandfather, Guru Sahai Rai was a patwari (village land record-keeper), and his father Ajaib Rai was a post office clerk. His mother was Anandi Devi of Karauni village, who probably was also his inspiration for the character Anandi in his Bade Ghar Ki Beti. Dhanpat Rai was the fourth child of Ajaib Lal and Anandi; the first two were girls who died as infants, and the third one was a girl named Suggi. His uncle, Mahabir, a rich landowner, nicknamed him "Nawab" ("Prince"). "Nawab Rai" was the first pen name chosen by Dhanpat Rai. When he was 7 years old, Dhanpat Rai began his education at a madrasa in Lalpur, located near Lamahi. He learnt Urdu and Persian from a maulvi in the madrasa. When he was 8, his mother died after a long illness. His grandmother, who took the responsibility of raising him, died soon after. Premchand felt isolated, as his elder sister had already been married, and his father was always busy with work. His father, who was now posted at Gorakhpur, remarried, but Premchand received little affection from his stepmother. The stepmother later became a recurring theme in Premchand's works. As a child, Dhanpat Rai sought solace in fiction, and developed a fascination for books. He heard the stories from the Persian-language fantasy epic Tilism-e-Hoshruba at a tobacconist's shop. He took the job of selling books for a book wholesaler, thus getting the opportunity to read a lot of books. He learnt English at a missionary school, and studied several works of fiction including George W. M. Reynolds's eight-volume The Mysteries of the Court of London. He composed his first literary work at Gorakhpur, which was never published and is now lost. It was a farce on a bachelor, who falls in love with a low-caste woman. The character was based on Premchand's uncle, who used to scold him for being obsessed with reading fiction; the farce was probably written as a revenge for this. After his father was posted to Jamniya in the mid-1890s, Dhanpat Rai enrolled at the Queen's College at Benares as a day scholar. In 1895, he was married at the age of 15, while still studying in the ninth grade. The match was arranged by his maternal step-grandfather. The girl was from a rich landlord family and was older than Premchand, who found her quarrelsome and not good-looking. His father died in 1897 after a long illness. He managed to pass the matriculation exam with second division(below 60% marks). However, only the students with first division were given fee concession at the Queen's College. He then sought admission at the Central Hindu College, but was unsuccessful because of his poor arithmetic skills. Thus, he had to discontinue his studies. He then obtained an assignment to coach an advocate's son in Benares at a monthly salary of five rupees. He used to reside in a mud-cell over the advocate's stables, and used to send 60% of his salary back home. Premchand read a lot during these days. After racking up several debts, in 1899, he once went to a book shop to sell one of his collected books. There, he met the headmaster of a missionary school at Chunar, who offered him a job as a teacher, at a monthly salary of ₹ 18. He also took up the job of tutoring a student at a monthly fees of ₹ 5. In 1900, Premchand secured a job as an assistant teacher at the Government District School, Bahraich, at a monthly salary of ₹ 20. Three months later, he was transferred to the District School in Pratapgarh, where he stayed in an administrator's bungalow and tutored his son. Dhanpat Rai first wrote under the pseudonym "Nawab Rai". His first short novel was Asrar e Ma'abid ("Secrets of God's Abode", Devasthan Rahasya in Hindi), which explores corruption among the temple priests and their sexual exploitation of poor women. The novel was published in a series in the Benares-based Urdu weekly Awaz-e-Khalk from 8 October 1903 to February 1905. Literary critic Siegfried Schulz states that "his inexperience is quite evident in his first novel", which is not well-organized, lacks a good plot and features stereotyped characters. Prakash Chandra Gupta calls it an "immature work", which shows a tendency to "see life only white or black". From Pratapgarh, Dhanpat Rai was relocated to Allahabad for training, and subsequently posted at Kanpur in 1905. He stayed in Kanpur for around four years, from May 1905 to June 1909. There he met Munshi Daya Narain Nigam, the editor of the Urdu magazine Zamana, in which he later published several articles and stories. Premchand visited his village Lamahi during the summer vacation, but did not find the stay enjoyable because of a number of reasons. He did not find the weather of the atmosphere conducive for writing. Plus, he faced domestic trouble due to quarrels between his wife and his step-mother. Premchand angrily scolded his wife, after she unsuccessfully tried to commit suicide by hanging. Dismayed, she went to her father's house, and Premchand displayed no interest in bringing her back. In 1906, Premchand married a child widow, Shivarani Devi, who was the daughter of a landlord from a village near Fatehpur. The step was considered to be revolutionary at that time, and Premchand faced a lot of social opposition. After his death, Shivarani Devi wrote a book on him, titled Premchand Ghar Mein ("Premchand in House"). In 1905, inspired by the nationalist activism, Premchand published an article on the Indian National Congress leader Gopal Krishna Gokhale in Zamana. He criticised Gokhale's methods for achieving political freedom, and instead recommended adoption of more extremist measures adopted by Bal Gangadhar Tilak. Premchand's first published story was Duniya Ka Sabse Anmol Ratan ("The Most Precious Jewel in the World"), which appeared in Zamana in 1907. According to this story, the most precious 'jewel' was the last drop of blood necessary to attain independence. Many of Premchand's early short stories had patriotic overtones, influenced by the Indian independence movement. Premchand's second short novel Hamkhurma-o-Hamsavab (Prema in Hindi), published in 1907, was penned under the name "Babu Nawab Rai Banarsi". It explores the issue of widow remarriage in the contemporary conservative society: the protagonist Amrit Rai overcomes social opposition to marry the young widow Poorna, giving up his rich and beautiful fiance Prema. According to Prakash Chandra Gupta, "while containing seeds of his future greatness in many ways, the novel is still youthful and lacks the discipline which full maturity brings". In 1907, another of Premchand's short novels, Kishna was published by the Medical Hall Press of Benares. This 142-page work, which satirises women's fondness for jewellery, is now lost. Literary critic Nobat Rai criticised the work in Zamana, calling it a mockery of the women's conditions. During April–August 1907, Premchand's story Roothi Rani was published in serial form in Zamana. Also in 1907, the publishers of Zamana published Premchand's first short story collection, titled Soz-e-Watan. The collection, which was later banned, contained four stories which sought to inspire the Indians in their struggle for political freedom. In 1909, Premchand was transferred to Mahoba, and later posted to Hamirpur as the Sub-deputy Inspector of Schools. Around this time, Soz-e-Watan was noticed by the British Government officials, who banned it as a seditious work. The British collector of the Hamirpur District ordered a raid on Premchand's house, where around five hundred copies of Soz-e-Watan were burnt. After this, Munshi Daya Narain Nigam, the editor of the Urdu magazine Zamana, who had published Dhanpat Rai's first story "Duniya Ka Anmol Ratan" advised the pseudonym "Premchand". Dhanpat Rai stopped using the name "Nawab Rai" and became Premchand. In 1914, Munshi Premchand started writing in Hindi (Hindi and Urdu are considered different registers of a single language Hindustani, with Hindi drawing much of its vocabulary from Sanskrit and Urdu being more influenced by Persian). By this time, he was already reputed as a fiction writer in Urdu. Sumit Sarkar notes that the switch was prompted by the difficulty of finding publishers in Urdu. His first Hindi story Saut was published in the magazine Saraswati in December 1915, and his first short story collection Sapta Saroj was published in June 1917. 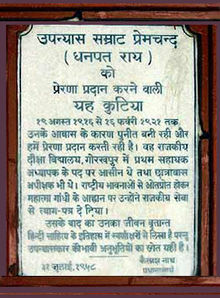 A plaque commemorating Munshi Premchand at the hut where he resided in Gorakhpur from 1916 to 1921. In August 1916, Premchand was transferred to Gorakhpur on a promotion. He became the Assistant Master at the Normal High School, Gorakhpur. At Gorakhpur, he developed a friendship with the bookseller Buddhi Lal, who allowed him to borrow novels for reading, in exchange for selling exam cram books at the school. Premchand was an enthusiastic reader of classics in other languages, and translated several of these works in Hindi. By 1919, Premchand had published four novels, of about a hundred pages each. In 1919, Premchand's first major novel Seva Sadan was published in Hindi. The novel was originally written in Urdu under the title Bazaar-e-Husn, but was published in Hindi first by a Calcutta-based publisher, who offered Premchand ₹ 450 for his work. The Urdu Publisher of Lahore published the novel later in 1924, paying Premchand ₹ 250. The novel tells the story of an unhappy housewife, who first becomes a courtesan, and then manages an orphanage for the young daughters of the courtesans. It was well received by the critics, and helped Premchand gain wider recognition. In 1919, Premchand obtained a BA degree from Allahabad. By 1921, he had been promoted to Deputy Inspectors of Schools. On 8 February 1921, he attended a meeting in Gorakhpur, where Mahatma Gandhi asked people to resign from government jobs as part of the non-cooperation movement. Premchand, although physically unwell and with two kids and a pregnant wife to support, thought about it for 5 days and decided, with the consent of his wife, to resign from his government job. After quitting his job, Premchand left Gorakhpur for Benares on 18 March 1921, and decided to focus on his literary career . Till his death in 1936, he faced severe financial difficulties and chronic ill health. In 1923, he established a printing press and publishing house in Benares, christened "Saraswati Press". The year 1924 saw the publication of Premchand's Rangabhumi, which has a blind beggar called Surdas as its tragic hero. Schulz mentions that in Rangabhumi, Premchand comes across as a "superb social chronicler", and although the novel contains some "structural flaws" and "too many authorial explanations", it shows a "marked progress" in Premchand's writing style. According to Schulz, it was in Nirmala (1925) and Pratigya (1927) that Premchand found his way to "a balanced, realistic level" that surpasses his earlier works and manages to "hold his readers in tutelage". Nirmala, a novel dealing with the dowry system in India, was first serialised in the magazine Chand between November 1925 and November 1926, before being published as a novel. Pratigya ("The Vow") dealt with the subject of widow remarriage. In 1928, Premchand's novel Gaban ("Embezzlement"), focusing on the middle class' greed, was published. In March 1930, Premchand launched a literary-political weekly magazine titled Hans, aimed at inspiring the Indians to mobilise against the British rule. The magazine, noted for its politically provocative views, failed to make a profit. Premchand then took over and edited another magazine called Jagaran, which too ran at a loss. In 1931, Premchand moved to Kanpur as a teacher in the Marwari College, but had to leave because of difference with the college administration. He then returned to Benares, and became the editor of the Maryada magazine. In 1932, he published another novel titled Karmabhumi. He briefly served as the headmaster of the Kashi Vidyapeeth, a local school. After the school's closure, he became the editor of the Madhuri magazine in Lucknow. Premchand arrived in Bombay on 31 May 1934 to try his luck in the Hindi film industry. He had accepted a script writing job for the production house Ajanta Cinetone, hoping that the yearly salary of ₹ 8000 would help him overcome his financial troubles. He stayed in Dadar, and wrote the script for the film Mazdoor ("The Labourer"). The film, directed by Mohan Bhawnani, depicted the poor conditions on the labour class. Premchand himself did a cameo as the leader of labourers in the film. Some influential businessmen managed to get a stay on its release in Bombay. The film was released in Lahore and Delhi, but was banned again after it inspired the mill workers to stand up against the owners. Ironically, the film inspired the workers of his own loss-making press in Benares to launch a strike, after they were not paid their salaries. By 1934–35, Premchand's Saraswati Press was under a heavy debt of ₹ 4000, and Premchand was forced to discontinue the publication of Jagaran. Meanwhile, Premchand was beginning to dislike the non-literary commercial environment of the Bombay film industry, and wanted to return to Benares. However, he had signed a one-year contract with the production house. He ultimately left Bombay on 4 April 1935, before the completion of one year. Himanshu Roy, the founder of Bombay Talkies, tried to convince Premchand to stay back, but did not succeed. After leaving Bombay, Premchand wanted to settle in Allahabad, where his sons Sripat Rai and Amrit kumar Rai were studying. He also planned to publish Hans from there. However, owing to his financial situation and ill-health, he had to hand over Hans to the Indian Literary Counsel and move to Benares. Premchand was elected as the first President of the Progressive Writers' Association in Lucknow, in 1936. He died on 8 October 1936, after several days of sickness and while still in office. Godaan upanyas (The Gift of a Cow, 1936), Premchand's last completed work, is generally accepted as his best novel, and is considered as one of the finest Hindi novels. The protagonist, Hori, a poor peasant, desperately longs for a cow, a symbol of wealth and prestige in rural India. According to Schulz, "Godan is a well-structured and well-balanced novel which amply fulfills the literary requirements postulated by the Western literary standards." Unlike other contemporary renowned authors such as Rabindranath Tagore, Premchand was not appreciated much outside India. Siegfried Schulz believes that the reason for this was absence of good translations of his work. Also, unlike Tagore and Iqbal, Premchand never travelled outside India, studied abroad or mingled with the renowned foreign literary figures. In 1936, Premchand also published Kafaan ("Shroud"), in which a poor man collects money for the funeral rites of his dead wife, but spends it on food and drink. Premchand's last published story was Cricket Matching, which appeared in Zamana in 1938, after his death. Premchand started taking an interest in political affairs while at Kanpur during the late 1900s, and this is reflected in his early works, which have patriotic overtones. His political thoughts were initially influenced by the moderate Indian National Congress leader Gopal Krishna Gokhale, but later, he moved towards the more extremist Bal Gangadhar Tilak. He considered the Minto-Morley Reforms and the Montagu–Chelmsford Reforms as inadequate, and supported greater political freedom. Several of his early works, such as A Little Trick and A Moral Victory, satirised the Indians who cooperated with the British Government. He did not specifically mention the British in some of his stories, because of strong government censorship, but disguised his opposition in settings from the medieval era and the foreign history. He was also influenced by the teachings of Swami Vivekananda. In the 1920s, he was influenced by Mahatma Gandhi's non-co-operation movement and the accompanying struggle for social reform. During this period, his works dealt with the social issues such as poverty, zamindari exploitation (Premashram, 1922), dowry system (Nirmala, 1925), educational reform and political oppression (Karmabhumi, 1931). Premchand was focused on the economic liberalisation of the peasantry and the working class, and was opposed to the rapid industrialisation, which he felt would hurt the interests of the peasants and lead to oppression of the workers. This can be seen in works like Rangabhumi (1924). Premchand's influence on Indian literature cannot be overstated. As the late scholar David Rubin wrote in The World of Premchand (Oxford, 2001), "To Premchand belongs the distinction of creating the genre of the serious short story—and the serious novel as well—in both Hindi and Urdu. Virtually single-handed he lifted fiction in these languages from a quagmire of aimless romantic chronicles to a high level of realistic narrative comparable to European fiction of the time; and in both languages, he has, in addition, remained an unsurpassed master." In his last days, he focused on village life as a stage for complex drama, as seen in the novel Godan (1936) and the short-story collection Kafan (1936). Premchand believed that social realism was the way for Hindi literature, as opposed to the "feminine quality", tenderness and emotion of the contemporary Bengali literature. On 31 July 2016, Google showed a Google doodle in honouring 136th birthday of Premchand. Premchand wrote over three hundred short stories and fourteen novels, many essays and letters, plays and translations. Many of Premchand's works were translated into English and Russian after his death. Devasthan Rahasya Asrar-e-Ma'abid Awaz-e-Khalk (serial form) 1903 (8 October)-1905 (February) English translation of the title: "The Mystery of God's Abode"
Vardaan Jalwa-e-Isar Granth Bhandar and Dhanju 1912 128 Vardan ("Boon") is about Pratap Cahndra and Brij Rani, two childhood neighbours who like each other. Brij gets married to another man and becomes a famous poet after being widowed. Her friend Madhvi starts liking Pratap after hearing about him from Brij. Pratap becomes a sadhu, and Madhvi becomes his devotee. Seva Sadan Bazaar-e-Husn Calcutta Pustak Agency (Hindi) 1919 (Hindi); 1924 (Urdu) 280 An unhappy housewife first becomes a courtesan, and then manages an orphanage for the young daughters of the courtesans. Godaan Saraswati Press 1936 344 English title: The Gift of the Cow. Themed around the socio economic deprivation as well as the exploitation of the village poor. Mangalsootra (incomplete) Hindustan Publishing House Premchand completed only first four chapters (around 70 pages) of this novel. Adeeb Ki Izat A story of writer who wanted respect and recognition of his work but later realised that he is a candle which will have to burn giving light to others. Saut Sarasvati (Vol. 16, Part 2, No. 6, 353–359) 1915 (December) The title means "co-wife". Sajjanata ka dand Sarasvati 1916 (March) The title means "The Penalty for Integrity". Panch Parameshvar Sarasvati 1916 (June) A friendship is marred when one friend delivers a verdict against the other. The story narrates how they reunite as friends. Ishwariya Nyaya Sarasvati 1917 (July) The title means "The Divine Law"
Durga ka Mandir Sarasvati 1917 (December) The title means "The Temple of Durga". Maa Sarasvati 1921 (November) The title means "Mother"
Balidan Sarasvati 1918 (May) The title means "Sacrifice". Putra Prem Sarasvati 1920 (July) The title means "Love of a Son". Boodhi Kaki (The Old Aunt) Hans 1921 An old woman craves for love from her family. Pariksha Chand 1923 (January) The title means "The Test". Its background is the Nadir Shah's invasion and sack of Delhi. The retiring minister Sardar Sujan Singh has been ordered by the king to find a new minister to replace him. The minister tests several candidates for a month and then announces the rightful successor based on his values of sympathy and bravery. Shatranj ki bazi (Urdu) Madhuri October 1924 Two aristocrats – Mirza Sajjad Ali and Mir Roshan Ali — live in the kingdom of Awadh during the times of the British Raj. Both of them are careless towards their duties and spend their days playing chess. Their love for the game is so immense that even when the ruler of Awadh, Wajid Ali Shah, is captured by the British they continue playing chess. In the end, a move in the game sparks a verbal conflict between them and they end up killing each other with their swords. Idgah Chand 1933 (August) A poor boy in India lives with his grandmother. On the festival day of Eid, the other kids buy themselves candies and toys. The poor boy, thinking of his grandmother, buys a pair of tongs to help her make rotis, since she burns her hands trying to cook them bare-handed. Nashaa Chand 1934 (February) Two friends from different strata of society study away from their homes. The story explores class disparity and aspirations in their friendship. It has an autobiographical touch. Kafan Jamia 1936 A low-caste father and his son are poor labourers in a village. An emergency occurs when the son's wife dies while giving birth to a child and the family has no money to cremate the body of the dead woman. The lazy duo ask for money from the village zamindar and other members of the society. However, they use the money they get on liquor and food instead. Gupt Dhan Haridas, a man of character, owns a brick factory. He loses his character when he gets a map of a hereditary treasure of a worker, but eventually dies as a punishment of god. Mantra The selfishness of a rich doctor named Chaddha results in the death of a patient. The same patient's father selflessly cures Dr. Chaddha's son, when the doctor meets the same sort of situation. Namak Ka Daroga 1925 (May) The title means 'The Salt Inspector'. An idealist becomes a police officer, and faces problems while performing his duties. Poos ki raat Madhuri 1930 (May) The title means "A night of the Poos month (Winter)". A poor farmer stays out with his dog to protect his field on an extremely cold December night. Lottery Zamana It is a story of an Indian family in which every member bought a ticket of a 1 million rupees worth lottery. After some time they began to fight over that what would they do if anyone win the lottery but at last neither from their home even town, state or country win the lottery but someone from America. "Vidhwans" The title means " Catastrophe". An old widow with no children is engulfed in a fire caused by the owner of the village intentionally and therefore, the pandit pays for the price. "Kazaki" A story of love, adore and friendship between a little boy and kazaki, a poor but cheerful and jolly man used to work under his father. Premchand translated several non-Hindi works into Hindi. These included the writings of Ratan Nath Dhar Sarshar, Leo Tolstoy, Charles Dickens (The Story of Richard Doubledick), Oscar Wilde (Canterville), John Galsworthy (Strife), Sadi, Guy de Maupassant, Maurice Maeterlinck (Sightless) and Hendrik van Loon (The Story of Mankind). Satyajit Ray filmed two of Premchand's works– Sadgati and Shatranj Ke Khiladi. Sadgati ("Salvation" or "Deliverance") is a short story revolving around poor Dukhi, who dies of exhaustion while hewing wood for a paltry favour. Shatranj ke Khiladi (The Chess Players) revolved around the decadence of nawabi Lucknow, where the obsession with a game consumes the players, making them oblivious of their responsibilities in the midst of a crisis. Sevasadanam (first published in 1918) was made into a film with M.S. Subbulakshmi in the lead role. The novel is set in Varanasi, the holy city of Hindus. Sevasadan ("House of Service") is an institute built for the daughters of courtesans. The lead of the novel is a beautiful, intelligent and talented girl called Suman. She belongs to a high caste. She is married to a much older, tyrannical man. She realises that a loveless marriage is just like prostitution except that there is only one client. Bholi, a courtesan, lives opposite Suman. Suman realises that Bholi is "outside purdah", while she is "inside it". Suman leaves her husband and becomes a successful entertainer of gentlemen. But after a brief period of success, she ends up as a victim of a political drama played out by self-righteous Hindu social reformers and moralists. The Actor Factor Theatre Company, a young Delhi based theatre group, staged Kafan in 2010 in New Delhi. It is an original stage adaptation of Premchand's short story. Kafan is a dark comedy. In the play, puppetry is explored to depict the tussle between two classes and the plight of Budhia, who is caught in the crossfire. Bleakness of hope in the story and awfulness of the father-son duo find a delicate balance. At times the situations break into morbid humour. In the end a wine-house becomes the stage for Ghisu (father) and Madhav's (son) rebellious dance, defying not only the laws of the land but also that of the Gods. Oka Oori Katha (English title: A Story of a village; Telugu: ఒక ఊరి కథ) is a 1977 Telugu film directed by Mrinal Sen. It is based on the story Kafan by Munshi Premchand. It is one of the few Art films made in Telugu language. Dramatech, a 28-year-old amateur theatre group in Delhi, staged Premchand: Three Comedies for Families and Children, at Sri Ram Centre, Delhi in August, September and October 2012. The stories by Premchand included Do bailon ki katha; Shatranj ke khiladi; Nimantran. The stories were dramatised and directed by Ravi Raj Sagar. A film version of Premchand's novel, Gaban, was released in 1966. Sunil Dutt, Sadhana Shivdasani, Kanhaiyalal and Leela Mishra acted in the film and the music was scored by musician duo Shankar Jaikishan. ^ Gopal, Madan (19 December 1944). Premchand (1 ed.). Lahore: The Bookabode. ^ "Premchand | Indian author". Encyclopedia Britannica. Retrieved 10 September 2018. ^ a b c Michael Sollars and Arbolina Llamas Jennings, ed. (2008). The Facts on File companion to the world novel: 1900 to the present. Infobase Publishing. pp. 631–633. ISBN 978-0-8160-6233-1. ^ Premchand: A Life, Amrit Rai (Harish Tirvedi, translator), People's Publishing House, New Delhi, 1982. ^ a b c d e f "Munshi Premchand: The Great Novelist". Press Information Bureau, Government of India. Retrieved 13 January 2012. ^ a b c Dr. Girirajsharan Agarwal (2001). Premchand : Karam Bhoomi (Abhyas Pustika) (in Hindi). Diamond. pp. 5–9. ISBN 978-81-7182-328-4. ^ Mohan Lal (2006). The Encyclopaedia of Indian Literature (Volume Five: Sasay To Zorgot). Sahitya Akademi. p. 4149. ISBN 978-81-260-1221-3. ^ Bhisham Sahni; Om Prakash Paliwal (1980). Premchand: a tribute. Premchand Centenary Celebrations Committee. ^ Sumit Sarkar (1983). Modern India, 1885–1947. Macmillan. pp. 85–86. ISBN 978-0-333-90425-1. ^ Madan Gopal (1964). Munshi Premchand: a literary biography. Asia Pub. House. pp. 114–117. ^ Harish Trivedi (2 May 2004). "The power of Premchand (Literary Review of The Oxford India Premchand)". The Hindu. ^ a b c d e f David Rubin (1994). "Short Stories of Premchand". In Barbara Stoler Miller (ed.). Masterworks of Asian literature in comparative perspective: a guide for teaching. M.E. Sharpe. pp. 168–177. ISBN 978-1-56324-258-8. ^ Prakash Chandra Gupta (1998). Makers Of Indian Literature Prem Chand. Sahitya Akademi. p. 35. ISBN 8126004282. ^ MAHAPRASHASTA, AJOY ASHIRWAD (30 December 2011). "Writers for change". Frontline. Retrieved 8 January 2013. ^ "India Heritage, Creative Arts, Literature". India Heritage, A living portrait of India. Retrieved 8 January 2012. ^ Rubin, David (2001). The World of Premchand. Oxford University Press (India). ISBN 0195657721. ^ a b Sheldon I. Pollock (2003). Literary cultures in history: reconstructions from South Asia. University of California Press. p. 1011. ISBN 978-0-520-22821-4. ^ Desk, Internet (31 July 2016). "Google doodle celebrates Munshi Premchand's Birth anniversary". The Hindu. Retrieved 3 November 2017. ^ Lal, Anupa. THE PREMCHAND READER Selected Stories 1. ^ Vishwanath S. Naravane (1980). Premchand, his life and work. Vikas. p. 190. ^ The best of Premchand: a collection of 50 best short stories. Cosmo Publications. 1997. p. xii. ISBN 978-81-7020-776-4. Retrieved 25 January 2013. ^ Govind Narain (1999). Premchand, novelist and thinker. Pragati Publications. p. 29. ISBN 978-81-7307-059-4. ^ Nagendra (1981). Premchand: an anthology. Bansal. p. 70. OCLC 8668427. Schulz, Siegfried A. (1981). Premchand: a Western appraisal. Indian Council for Cultural Relations. OCLC 10062769. Archived from the original on 19 June 2013. Retrieved 13 January 2012. Gupta, Prakash Chandra (1998). Makers of Indian Literature: Prem Chand. Sahitya Akademi. ISBN 978-81-260-0428-7. Sigi, Rekha (2006). Munshi Prem Chand. Diamond. ISBN 978-81-288-1214-9. Amrit Rai; Harish Trivedi (1991). Premchand: his life and times. Oxford University Press. ISBN 978-0-19-562894-4. Francesca Orsini (2004). The Oxford India Premchand. Oxford University Press. p. ix. ISBN 978-0-19-566501-7. Wikimedia Commons has media related to Premchand. This page was last edited on 22 April 2019, at 13:18 (UTC).